Supernatural: Is Mary Hiding Another Secret? And Is Mom On Her Way Out? This Wednesday on Supernatural, the Winchesters go where everyone knows their name — a hunter’s wake — and Mary gets a very tempting offer. RELATEDWas Supernatural‘s Hitler Episode Just Right or All Kinds of Wrong? At the gathering, where Dean and Sam are bombarded with questions about being “dead, like, four times” and being possessed by Lucifer — someone send these fanboy hunters a set of Supernatural books! — a secret about Mary’s past comes out. As a young boy in 1980, the now-dead hunter was saved by Mary, meaning she was still hunting after she and John got married and had Dean. As much as she wanted to get away from it, Mary wasn’t quite as retired from monster-killing as her children — and viewers — were led to believe. Meanwhile, tensions between Dean and his mom are at an all-time high. “So you’ll text us once a week, maybe, but you’ll drive all the way to Canada to see some dead guy?” Dean snipes when Mary shows up at the wake. But the problem isn’t Dean or Sam. It’s that poor Mary just doesn’t feel like she belongs on Earth, which Billie the reaper instantly recognizes. “You hate it,” she says, before offering Mary a chance to go back upstairs. And my goodness, it looks like Mama Winchester is going to take her up on it, but then Billie reminds her that reapers collect, not kill. 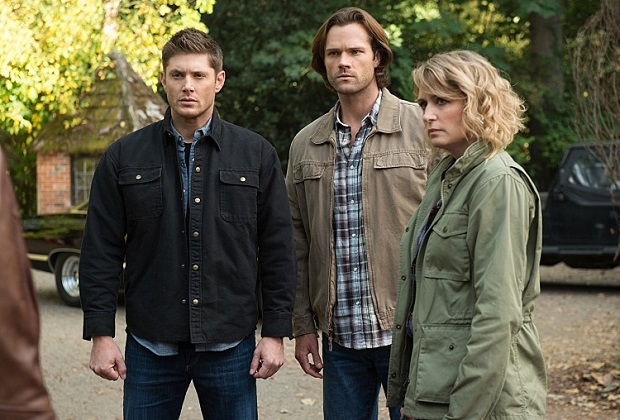 My first thought: So Dean or Sam will have to off their mom?! Way harsh (but totally something this show would do). Or will Mary hold off until she dies on the job? While I’m curious to see if and how Mary will actually say goodbye — it seems inevitable that she will, no? — there’s another question burning a hole in my brain: What is Mary doing in her time away from Dean and Sam? She says she’s retracing John’s steps via his journal, but why? What is she trying to fill in? Why does she still need “a little more time” away from her sons? Could she be hiding something? Supernatural fans, am I overthinking Mary’s offscreen adventures? Hit the comments with thoughts/theories! Arrow Recap: Double Double-Cross -- Does the Team Have a Mole?